I have received this product from MGA as part of their toytester program. Every girl has the strength to do something amazing. Anything is possible as long as you stay true to yourself and never give up on your dreams! Lexa, Avery, Sophina and Bria are all about expressing themselves and reaching for the stars. They know they can accomplish anything they want to, as long as they believe in themselves and support each other by being loyal friends! Whether it's painting, cooking or just using their imaginations, Moxie Girlz™ love to get creative! Sophina™ wins first prize for her lemon cupcakes! Doll & baking set includes 10+ accessories, including a scented lemon cupcake recipe card for real baking fun. Bonus! Doll can really sit and stand on her own, no doll stand required! I was really impressed with this doll! I love that I do not need a stand and the doll does not fall! The accessories are really detailed and fun! The kids love them! 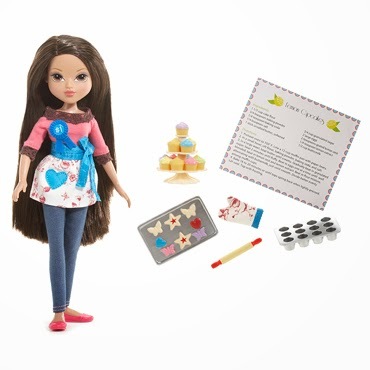 I mean who in the world would not love a "Baking Doll" I wish they was this creative in my days! The kids can be kind of rough on their toys so I am also really excited that the doll, itself, has not been broken! #spon: I’m required to disclose a relationship between our site and MGAE. This could include MGAE providing us w/content, product, access or other forms of payment.